OVERSTOCK SALE! Shop our overstock section Monday - Friday, 52 weeks a year. 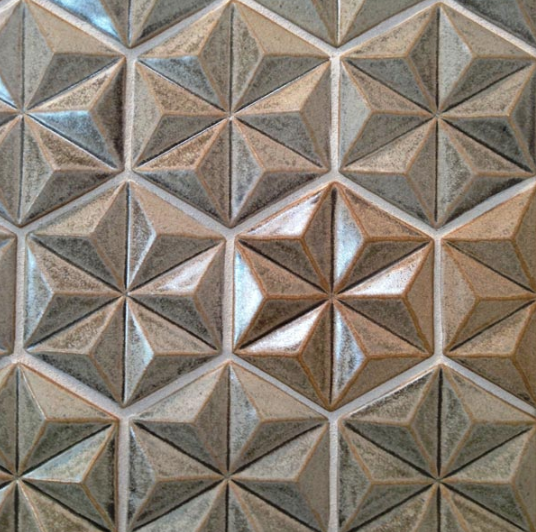 When it comes to inlay brass tile, New Ravenna and Tabarka Studio have it dialed in. Whether you are looking for a minimal-modern tile, something playful, or an incredibly detailed mosaic piece, they’ve got you covered. Scroll through to see a few of our favorites. 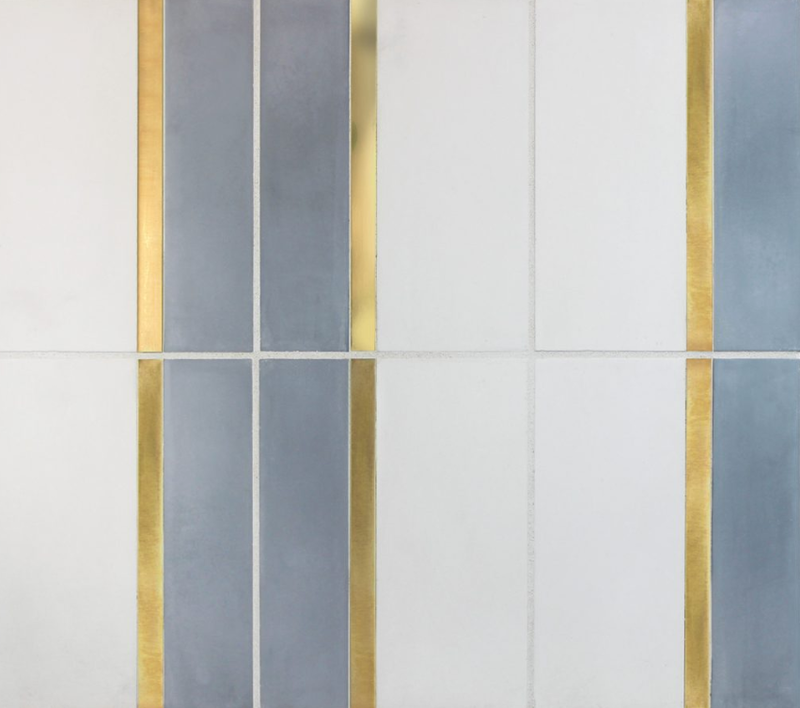 Simone, a waterjet stone mosaic, shown in honed Calacatta Gold, honed Thassos, and brushed Brass, is part of The Studio Line of Ready to Ship mosaics. KAVIM from Tabarka Studio is a line brass inlay cement tile, inspired by Architect Luis Barragán. Sublte pink, green, grey and white to choose from and countless layout options. "This kitchen’s tumbled-metal mosaic backsplash tiles from The Fine Line in Chicago were among the first design choices for the penthouse. Louise Gaskill fabricated the equally bold pendant lights; the vintage barstools are from Modern Manor. Counters from Cactus Stone & Tile—polished granite on the island and leathered granite for the perimeters—top white-oak cabinetry fabricated by Desert Cove Woodworks." Collins, a waterjet stone mosaic, shown in honed Calacatta Gold and Brass, is part of the Trove™ collection for New Ravenna. 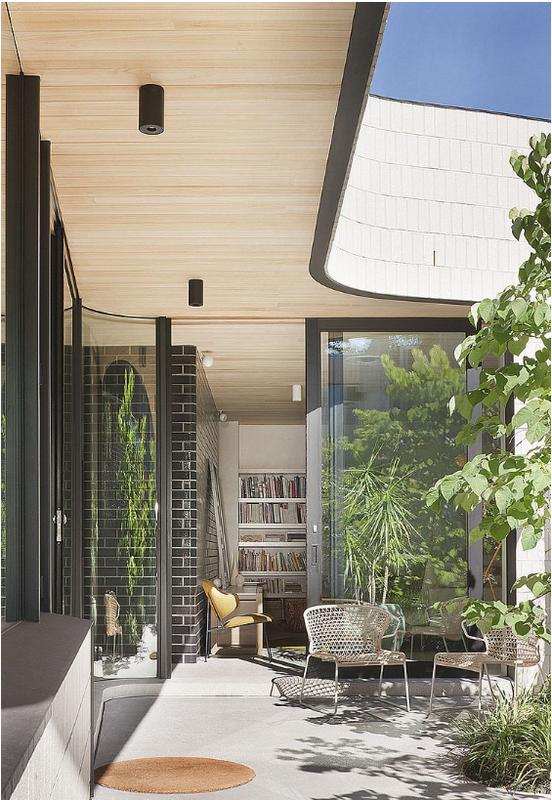 This house is brick inside and out! A stunning use of brick and tile in the kitchen, bathroom, and living room in this new addition to a traditional Eduardian house. Dimensional pattern at it's best. Modern but timeless tile, all handcrafted in the USA by the talented Arto (CA), Syzygy (NM), Monkey Works (WA), and ModCraft (NY). Each can be ordered in the glaze of your choice and all are available through our showroom. Shout out to birthday boy, David Hockney ! David Hockney is an artist of many talents but the way he captured the California Pool vibe in the mid 1900's will always have a special place in our hearts. HBD Hockney!!! Check us out in Luxe Magazine! Nov/Dec 2017 Issue. We were honored to be interviewed by Mimi Faucett for a feature in Luxe Interiors + Design Magazine. Full interview below! The robust collection of ceramic tiles at Portland-based Tempest Tileworks range from milky-toned field tiles to signature, so-called “wall tapestries,” which are large-scale ceramic murals dense with textile-quality pattern. Founded in 2006 by Andy Morrison and Leigh O’Dell, Tempest’s team employs traditional silkscreening methods and bespoke coloring processes to animate the clay, often deriving inspiration from antique prints and time-honored Italian fabric houses, such as Fortuny. “I love a sense of history, real and imagined,” says Morrison. We caught up with the pair to learn more about the inner workings of Tempest. Where in Portland are you located? Leigh O’Dell: Inner Southeast, next to Big Branch Woodworking. There are many makers all over Portland right now–whether they’re distilling liquor, making ceramics or woodworking. You can find anything here in Portland. You often refer to tile as one would to tapestry or fabric. Tell us about this. LO: Tapestries, fabrics and wallpaper were traditionally used to cover and enhance entire walls. Our patterned tiles do just the same. Tile does not have to be limited to a kitchen backsplash or bath shower. How much of your work is custom? AM: I think of all jobs as custom. This tile, most likely, will be looked at and hopefully enjoyed for years, even decades to come.